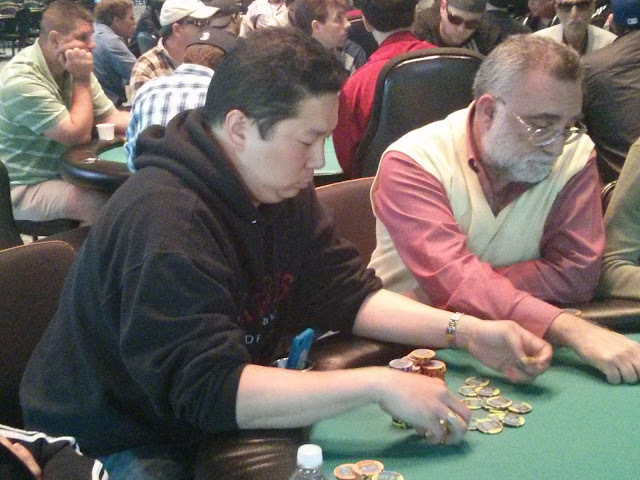 We are down to 22 players in today's $400 Mega Stack, and the tournament is now hand for hand. A player at the feature table was just crippled, so tune in to www.FoxwoodsLive.com and you may see the bubble burst! Cards are back in the air for today's $400 Mega Stack Tournament. Blinds are now 1,500/3,000 with a 500 ante. With the completion of 1,200/2,400 blinds, the 48 remaining players are now on their one hour dinner break. The tournament staff will be racing off the 100 chips during this break, and the blinds will be 1,500/3,000 with a 500 ante after dinner. Play will continue at approximately 8pm EST. The 78 remaining players from today's $400 Mega Stack tournament are now on their last break of the day before dinner. When they return, they will play two 40 minute levels and then go on a 1 hour dinner break. Happy birthday to Bernard Lee! Happy birthday to Bernard Lee, who is in today's $400 Mega Stack field. Players are returning to their seats after their second break of the day, and will now be playing 200/400 blinds with a 50 ante. Registration will be closed shortly, and it looks like there will be a bit of an overlay on today's $80,000 Guarantee. Stay tuned for the prize pool & payouts to be released. Players are now on their first break of the day. There are 127 players in the field so far today, and registration is still open for 3 more levels. Cards are in the air for today's $400 Mega Stack tournament. Players start with 20,000 chips and are playing 30 minute levels through level 12, and then 40 minute levels afterwards. There's an $80,000 guarantee on this event, so come down and register to play for your piece of the prize pool!